The family office sphere is of great interest to lawyers, accountants, trust companies, those in private banks and the financial world, as well as family office executives and wealthy families themselves. This new handbook, prepared in association with the Society of Trust and Estate Practitioners, features chapters from leading players in the field, including JP Morgan, SandAire, Family Capital Conservation Limited, Penningtons Solicitors LLP, Baker & McKenzie and Berenberg Bank. The book steers readers through the family office model from its inception, focusing on the viability of family offices for those at the margin of what is normally regarded as the minimum financial base and comparing this to a family worth many millions. 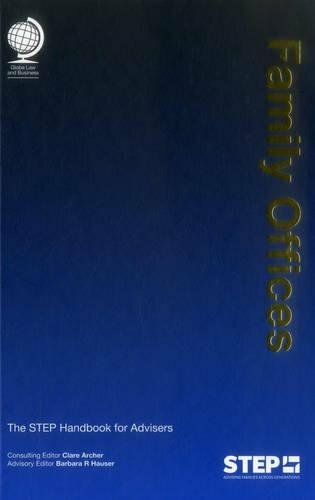 The book also considers a range of issues around the cultural development of the family office from the larger complex structures of North America to the emergence of family offices in developing jurisdictions. Whether the reader is a professional practising in the family office sphere, a family member or a new entrant to this diverse and challenging arena, this practical new title will serve as an interesting guide, providing valuable comment and insight into the family office world.